The Medusa T40 was a clone of the rare and expensive Atari TT/030 computer. It used generic off the shelf PC parts including 72 pin memory, Medusa just made the motherboard which fits a standard PC AT case, and was sold as complete system or just a board. The board had 4 sockets for the slightly tweaked TOS 3.06 ROMs as used on the TT. 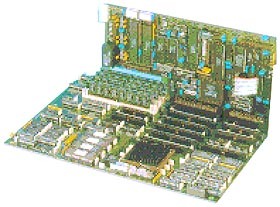 There was one ISA slot for a standard VGA video card. It filled a hole due to Atari users was able to enjoy a new high end workstation computer as a new model TT or Falcon did not materialise as Atari stopped making computers altogether. It ran all cleanly written Atari application software, but not games due to different hardware used. Was only available from the manufacturer in Switzerland. It is not known how many unit were sold due to being a very unusual computer. The next step up from the T40 is the Medusa Hades. It has more efficient design, the DMA port for Atari SLM Laser printer and Megafile hard disk. Atari keyboard port was dropped. As it has cpu on the main board rather on a card and features PCI slots. It has optional Startrack VME sound card which give DSP processor as used on the Atari Falcon 030 computer. The Medusa Hades board is still being sold today here. I/O PORTS Parallel, modem 1 and 2, Localtalk, MIDI in and out, DMA/ACSI, PC keyboard, Atari Mega/TT keyboard, Atari mouse, Atari joystick, one ISA slot. Optional LAN. see more Medusa T-40 Ebay auctions !